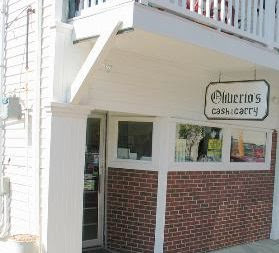 When I first moved to West Virginia, found the coolest little store, Oliverio’s Cash & Carry. It was a kind of "mom and pop" grocery with a twist. They have many Italian specialities, including their own line of peppers and pickles vegetables. But in the back, they made their own sausage. Hand made. In a crank-handled Enterprise sausage stuffer. 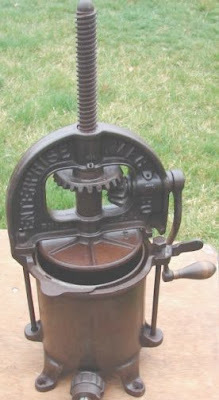 The Enterprise Sausage Stuffer/ Fruit Press/ Lard Extractor is one of the most beautiful machines ever made. This picture doesn't do it justice. I would have photographed my Enterprise but alas, I don't own one. Shocking, I know. Trust me, it is high on my list of acquisitions. Some women covet Christian Louboutin shoes, I covet an Enterprise sausage stuffer, fruit press, lard extractor. Don't get me wrong, I would look great in these shoes, but for $700 I could have two or three Enterprise sausage stuffers, a 2-quart, a 4-quart AND an 8-quart or just a 4-quart and two pigs! I don't know if Martha Stewart has an Enterprise stuffer, she probably does. 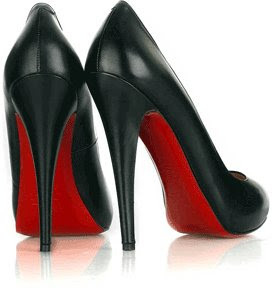 I know she has Christian Louboutin shoes; she has her assistant take a black magic marker and color the souls, because she doesn't like the red. back to Oliverio’s Cash & Carry. Right after I moved here, Jane and Michael Stern, of Roadfood fame, wrote a big article for Gourmet about West Virginia and included Oliverio's. After that article came out, you needed to call to make sure they had sausage available. This week, The New York Times did a big food article about West Virginia and mentioned Oliverio’s Cash & Carry. So now it is official, Oliverio’s Cash & Carry has the best sausage in the world. Alas, like Birkin Bags, one may now have to get on a waiting list just to get some sausage. I assure you, it will be worth the wait. In the meantime, snack on a pepperoni roll. We all know that a sous vide contraption is high on your list too! "Some women covet Christian Louboutin shoes, I covet an Enterprise sausage stuffer, fruit press, lard extractor." You and I are two peas in a pod. I just made 50 lbs. of sausage with my sister-in-law and our husbands yesterday, and we used a 100-year-old Enterprise sausage stuffer. It's miraculous; I can never imagine making sausage with a $2000 motorized stainless-steel contraption.